While travelling through many reasons that cause global warming, Ozone layer depletion is one of the major reasons for it. In order to know more about ozone layer depletion, we need to learn what ozone layer is. Let us dig deep into what is ozone layer, how it is formed, causes and effects of ozone depletion and measures to prevent it. Our earth’s atmosphere is divided into different layers. Each layer has its own specific functions. The different layers of the atmosphere are named as troposphere, stratosphere, mesosphere, thermosphere and exosphere. Each of these layers has boundaries. Above the troposphere is tropopause; above the stratosphere is stratopause; above the mesosphere is mesopause and above the thermosphere is thermopause. Troposphere : This is lowest layer of the atmosphere where we humans live. It extends for about 10km above the sea level. All the weather changes take place in this level. Temperature and air pressure decreases as increase in height. Stratosphere : This layer comes after troposphere. It extends for about 50kms above the ground. The famous ozone layer lies in this zone. Since the air in this layer is low in turbulence passenger flights and jets fly through this. Mesosphere : Above stratosphere comes the mesosphere. It extends about 85kms above the planet. The meteorites burn up in this layer. The air and its pressure are thin in this layer. Thermosphere : This layer is just above the mesosphere. It extends about 600kms above the planet. Since the air is very thin its freezing cold in this layer. Most of the satellites orbit the earth within thermosphere. Exosphere : This is the uppermost layer of the atmosphere. It extends about 10,000kms above the planet. This is almost half way to the moon. Since there is no clear cut boundary, the exosphere finally blends into outer space. The ozone layer was discovered by 2 French physicists named Henri Buisson and Charles Fabry in 1913. The ozone layer is concentrated in stratosphere. Ozone is a molecule that contains 3 oxygen atoms. These molecules are continuously formed and destroyed in this layer. 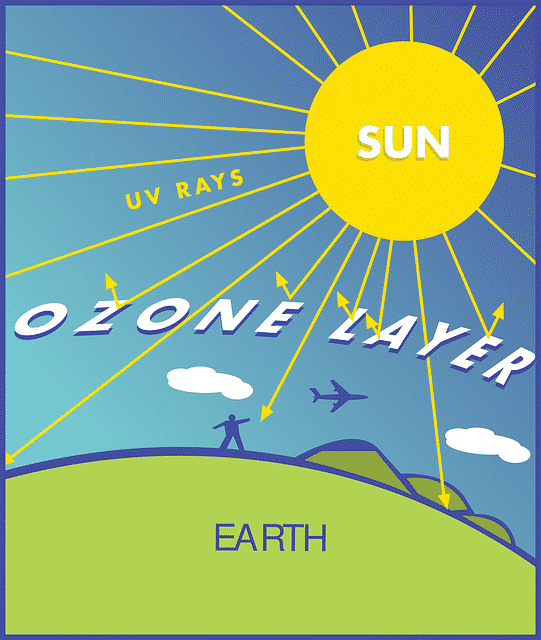 This ozone layer acts as a blanket to prevent the harmful ultraviolet rays from entering the earth. This layer is made up of other atmospheric gases like nitrogen, oxygen and argon but significantly higher concentration of ozone. Lower traces of other gases found are carbon dioxide, neon, helium, methane and manmade chlorofluorocarbons or CFCs. The ozone layer is the lower layer in the stratosphere and begins at an altitude of 9 miles and stretches upto 21 miles. This layer is naturally formed in stratosphere. An oxygen atom reacts with an oxygen molecule to form ozone. This happens when there is high energetic solar radiation through a process named photolysis. The molecular formula for ozone is O3. Most of the ozone is formed above the equatorial belt because the solar radiation is high here. The ozone layer varies with latitude and season and weather. As per the study, ozone layer is highest in Siberia and Canada and lowest near the equator. Ozone is also formed from combustion of vehicles. One of the most dangerous reasons for the depletion of ozone layer is emission of chlorofluorocarbons. This is commonly emitted by electrical appliances and aerosol cans. Chlorine is the main contend in these gases which have proved to be a threat to the ozone layer. One atom of chlorine can destroy upto a hundred thousand ozone molecules. This situation is reversible over a period of time if the emission from chlorofluorocarbons reduces immensely. Another reason that has contributed to depletion of ozone layer is the major volcanic eruptions in 1991 which is Mt.Pinatubo and El Chichon in 1983. Depletion of ozone layer is caused due to the high pollution from vehicles over the years. Halons are another reason for ozone depletion. These are widely used in fire extinguishers. Another reason for ozone depletion is Methyl Chloroform. This is commonly used in industries for chemical processing, adhesives and cold cleaning. Hydrofluorocarbons is yet another reason for the depletion. This is not as harmful as chlorofluorocarbons. Another reason for the depletion is abundant deforestation. Threat to human existence : Humans are the most affected due to the depletion of ozone layer. Over exposure to ultraviolet rays can lead to numerous skin problems like sun burns, skin cancer, aging, eye damage and even weakening of the immune system. Impact on amphibians : The life cycle of many species gets affected due to ozone layer depletion. It disturbs the growth and development of the larvae, causes deformities in life cycle of many species. Immunity of the species becomes weak which can lead to disease and death. Effect on marine life : Marine life gets greatly affected by harmful ultraviolet rays. Marine phytoplankton plays an important in food chain of marine species. They decrease in number due to the overexposure to UV rays. Impact on plants : Plants are greatly affected by this depletion. The growth and development of the plants gets affected. Its flowering capacity can fade off due to the overexposure to ultraviolet rays. The depletion of the ozone layer can lead to drastic change in the temperature and climate of the areas. This will ultimately lead to global warming. Limit the use of private vehicles : This is the easiest way to control depletion of ozone layer. This reduces the emission of smog from the vehicles. Switching to electric vehicles, car pooling, more use of cycles and use of public transport is always the wiser option. Avoid pesticides : Pesticides are used for improving the yields and to remove pests. But they add to the depletion of the ozone layer. Using natural remedies and manmade manure for crops are ideal. This in turn improves the general health of the people. Don’t buy products with CFC’s : Although CFC’s are banned in most of the products, kindly make sure about the contents from the label especially on deodorants and hair sprays. Avoid using laughing gas : Laughing gas is also known as nitrous oxide. The use of nitrous oxide should be controlled and used at a minimal rate. This oxide mixes with ozone and depletes it. Planting more number of trees reduces the depletion to an extent. Use eco friendly products and avoid the use of plastics and non biodegradable products. Avoid using old home appliances and other household products to reduce its harmful emission. Use of more recycled products. Spread awareness among people about the importance, deletion and ways to protect the ozone layer. To conclude, the ozone layer is a most important layer for the existence of the earth. So it is very necessary to understand the importance of this layer that acts as a warrior to the earth. This is worldwide concern that has inversely affected the area around the Antarctic. This is mainly because of the low temperatures here which aggravates the reaction of chlorine with the ozone to destroy it. The destruction has geared up to 65% which is commonly called ozone hole. In many other regions the deterioration is about 20%. But the good news here is that the ozone layer can be saved and it can be repair itself over a period of time. If all the ozone depleting chemicals like CFC’s, Halons and all other products are banned completely then the repair of the ozone hole is possible. Scientist believes that if all these measures are followed then by the year 2050 the ozone layer will return back to normal. So let all of us take a pledge and work together for a noble cause “Save the earth”.